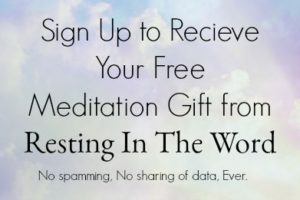 Guided meditation to heal the spirit and quiet the mind. Welcome to Episode 1 of Resting in the Word, a scripture meditation podcast created to refresh the spirit and relax the mind. This show is designed for anyone who struggles to find a restful night’s sleep but is also looking for more than just healing the body. Here you’re given a choice to meditate upon the inspirational words that can and will change your life. Resting in the Word is created to help you enjoy all the mental, physical and spiritual health benefits that come with finally getting the rest your body so desperately needs. As you listen, you begin with the soothing sounds of music, along with your host, Connie Minnell, who will guide you through a personal time of spiritual reflection. Then, as you gently move into the relaxing meditation, you allow all the benefits of the divinely inspired word of God, words of peace and grace, to come to rest in your spirit. As the weeks go by, you will find that this is as much a journey of faith for me as it may become for you, so I humbly ask for your words or prayers of encouragement for Resting in the Word. In return, I will also be praying for you. If you like what you hear, please tell someone else. You never know how you can bless another person’s life just by sharing what you know. If they don’t know what a podcast is or how to access one, just send them to my website at restingintheword.org, and they can listen there. Note: This podcast is created to help you relax and sleep, please do not listen to while driving or other activities that require your full attention.